^ Ash, M. E.; Shapiro, I. I.; Smith, W. B. Astronomical constants and planetary ephemerides deduced from radar and optical observations. The Astronomical Journal. 1967, 72: 338. Bibcode:1967AJ.....72..338A. doi:10.1086/110230. ^ Staff. Trigonometric Parallax. The SAO Encyclopedia of Astronomy. Swinburne Centre for Astrophysics and Supercomputing. [2008-10-18]. ^ Perryman, M. A. C.; 等. The HIPPARCOS Catalogue. Astronomy and Astrophysics. 1999, 323: L49–L52. Bibcode:1997A&A...323L..49P. ^ Harrington, J. D.; Villard, R. NASA's Hubble Extends Stellar Tape Measure 10 Times Farther Into Space. NASA. 10 April 2014 [17 October 2014]. 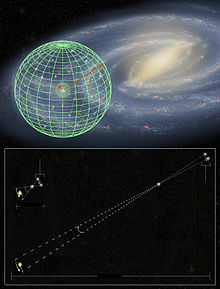 ^ Riess, A. G.; Casertano, S.; Anderson, J.; MacKenty, J.; Filippenko, A. V. Parallax Beyond a Kiloparsec from Spatially Scanning the Wide Field Camera 3 on the Hubble Space Telescope. The Astrophysical Journal. 2014, 785 (2): 161. Bibcode:2014ApJ...785..161R. arXiv:1401.0484. doi:10.1088/0004-637X/785/2/161. ^ B., Baidyanath. An Introduction to Astrophysics. PHI Learning Private Limited. 2003. ISBN 81-203-1121-3. ^ Hubble finds Universe may be expanding faster than expected. [3 June 2016]. ^ Hubble stretches the stellar tape measure ten times further. ESA/Hubble Images. [April 12, 2014]. ^ Popowski, P.; Gould, A. Mathematics of Statistical Parallax and the Local Distance Scale. 1998. arXiv:astro-ph/9703140. ^ Bartel, N.; 等. The shape, expansion rate and distance of supernova 1993J from VLBI measurements. Nature. 1994, 368 (6472): 610–613. Bibcode:1994Natur.368..610B. doi:10.1038/368610a0. 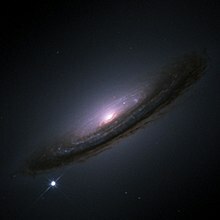 ^ Type Ia Supernova. Weekly Topic. Caglow. [30 January 2012]. ^ Hendry, Martin; Woan, Graham. Gravitational astrophysics. Astronomy & Geophysics. February 2007, 48 (1): 1.10–1.17 [October 16, 2017]. Bibcode:2007A&G....48a..10H. doi:10.1111/j.1468-4004.2007.48110.x. ^ Holz, Daniel; Hughes, Scott; Shultz, Bernard. Measuring cosmic distances with standard sirens. Physics Today. 2018, 71 (12): 35–40. doi:10.1063/PT.3.4090. ^ Abbott, B. P.; 等. A gravitational-wave standard siren measurement of the Hubble constant. Nature. 16 October 2017, 551 (7678): 85–88. Bibcode:2017Natur.551...85A. PMID 29094696. arXiv:1710.05835. doi:10.1038/nature24471. ^ Bonanos, Alceste Z. Eclipsing Binaries: Tools for Calibrating the Extragalactic Distance Scale. Binary Stars as Critical Tools and Tests in Contemporary Astrophysics, International Astronomical Union. Symposium no. 240, held 22–25 August 2006 in Prague, Czech Republic, S240, #008. 2006, 2: 79–87. Bibcode:2007IAUS..240...79B. arXiv:astro-ph/0610923. doi:10.1017/S1743921307003845. ^ Ferrarese, Laura; Ford, Holland C.; Huchra, John; Kennicutt, Robert C., Jr.; Mould, Jeremy R.; Sakai, Shoko; Freedman, Wendy L.; Stetson, Peter B.; Madore, Barry F.; Gibson, Brad K.; Graham, John A.; Hughes, Shaun M.; Illingworth, Garth D.; Kelson, Daniel D.; Macri, Lucas; Sebo, Kim; Silbermann, N. A. A Database of Cepheid Distance Moduli and Tip of the Red Giant Branch, Globular Cluster Luminosity Function, Planetary Nebula Luminosity Function, and Surface Brightness Fluctuation Data Useful for Distance Determinations. The Astrophysical Journal Supplement Series. 2000, 128 (2): 431–459. Bibcode:2000ApJS..128..431F. arXiv:astro-ph/9910501. doi:10.1086/313391. ^ S. A. Colgate. Supernovae as a standard candle for cosmology. Astrophysical Journal. 1979, 232 (1): 404–408. Bibcode:1979ApJ...232..404C. doi:10.1086/157300. ^ Assessing potential cluster Cepheids from a new distance and reddening parameterization and 2MASS photometry. MNRAS. Bibcode:2008MNRAS.390.1539M. arXiv:0808.2937. doi:10.1111/j.1365-2966.2008.13834.x. ^ Stanek, K. Z.; Udalski, A. The Optical Gravitational Lensing Experiment. Investigating the Influence of Blending on the Cepheid Distance Scale with Cepheids in the Large Magellanic Cloud. Eprint arXiv:astro-ph/9909346. 1999: 9346. Bibcode:1999astro.ph..9346S. arXiv:astro-ph/9909346. ^ Udalski, A.; Wyrzykowski, L.; Pietrzynski, G.; Szewczyk, O.; Szymanski, M.; Kubiak, M.; Soszynski, I.; Zebrun, K. The Optical Gravitational Lensing Experiment. Cepheids in the Galaxy IC1613: No Dependence of the Period-Luminosity Relation on Metallicity. Acta Astronomica. 2001, 51: 221. Bibcode:2001AcA....51..221U. arXiv:astro-ph/0109446. ^ Ngeow, C.; Kanbur, S. M. The Hubble Constant from Type Ia Supernovae Calibrated with the Linear and Nonlinear Cepheid Period-Luminosity Relations. The Astrophysical Journal. 2006, 642: L29. Bibcode:2006ApJ...642L..29N. arXiv:astro-ph/0603643. doi:10.1086/504478. ^ Macri, L. M.; Stanek, K. Z.; Bersier, D.; Greenhill, L. J.; Reid, M. J. A New Cepheid Distance to the Maser-Host Galaxy NGC 4258 and Its Implications for the Hubble Constant. The Astrophysical Journal. 2006, 652 (2): 1133. Bibcode:2006ApJ...652.1133M. arXiv:astro-ph/0608211. doi:10.1086/508530. ^ Bono, G.; Caputo, F.; Fiorentino, G.; Marconi, M.; Musella, I. Cepheids in External Galaxies. I. The Maser-Host Galaxy NGC 4258 and the Metallicity Dependence of Period-Luminosity and Period-Wesenheit Relations. The Astrophysical Journal. 2008, 684: 102. Bibcode:2008ApJ...684..102B. doi:10.1086/589965. ^ Majaess, D.; Turner, D.; Lane, D. Type II Cepheids as Extragalactic Distance Candles. Acta Astronomica. 2009, 59: 403. Bibcode:2009AcA....59..403M. ^ Madore, Barry F.; Freedman, Wendy L. Concerning the Slope of the Cepheid Period-Luminosity Relation. The Astrophysical Journal. 2009, 696 (2): 1498. Bibcode:2009ApJ...696.1498M. doi:10.1088/0004-637X/696/2/1498. ^ Scowcroft, V.; Bersier, D.; Mould, J. R.; Wood, P. R. The effect of metallicity on Cepheid magnitudes and the distance to M33. Monthly Notices of the Royal Astronomical Society. 2009, 396 (3): 1287. Bibcode:2009MNRAS.396.1287S. doi:10.1111/j.1365-2966.2009.14822.x. ^ Majaess, D. The Cepheids of Centaurus A (NGC 5128) and Implications for H0. Acta Astronomica. 2010, 60: 121. Bibcode:2010AcA....60..121M. Pasachoff, JM & Filippenko, AV, The Cosmos: Astronomy in the New Millennium, Cambridge: Cambridge University Press, 4th edition, 2013 ISBN 9781107687561.